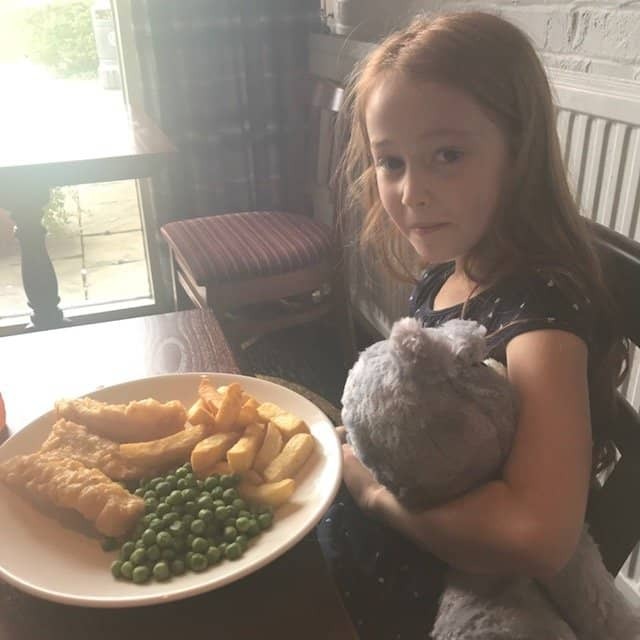 We love taking Ava and Thea out to eat and they have developed a taste for pub lunches recently. Mainly the puddings. 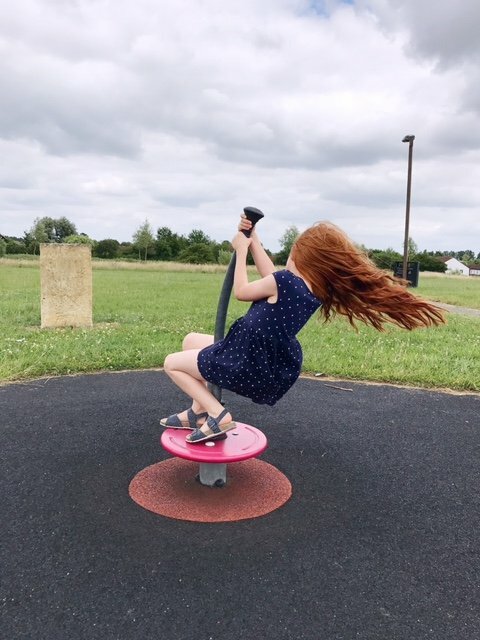 A couple of weeks ago we were invited to review The Giffard Park, a recently refurbished pub near Milton Keynes*. We don’t really give them desserts at home, apart from fruit or a yoghurt. 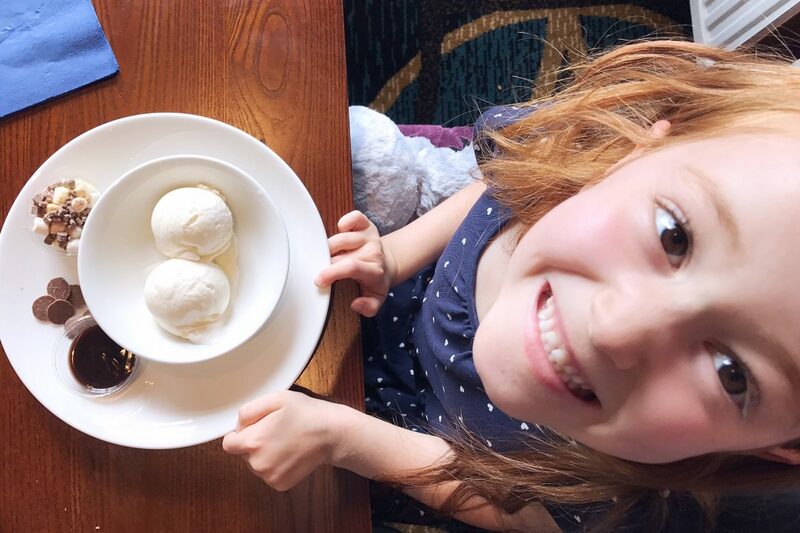 They know they’re in for an ice-cream when we go out to eat. Ryan was a bit dubious when I told him where we were going. He’d been to this pub many (many) years ago, and it wasn’t nice nicest back then! But he was very pleasantly surprised when we got there. The Giffard Park is a fairly standard chain pub, with plenty of tables and a well-stocked bar. 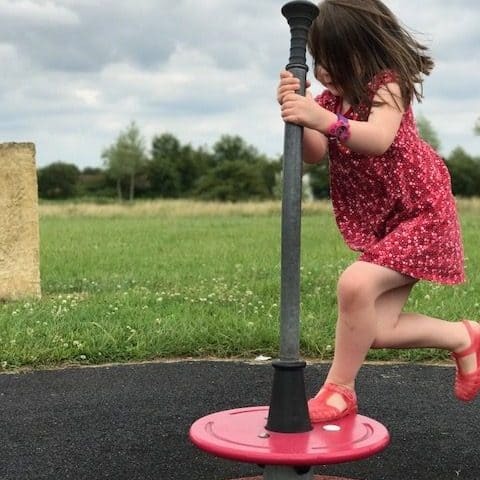 But where it differs from other similar places is the staff – nothing was too much trouble for them, and they were very friendly. We sat down at a table and read the extensive menus before I went to order at the bar. The table was a bit sticky, which is one of my pet hates, but that may have been because of the varnish. 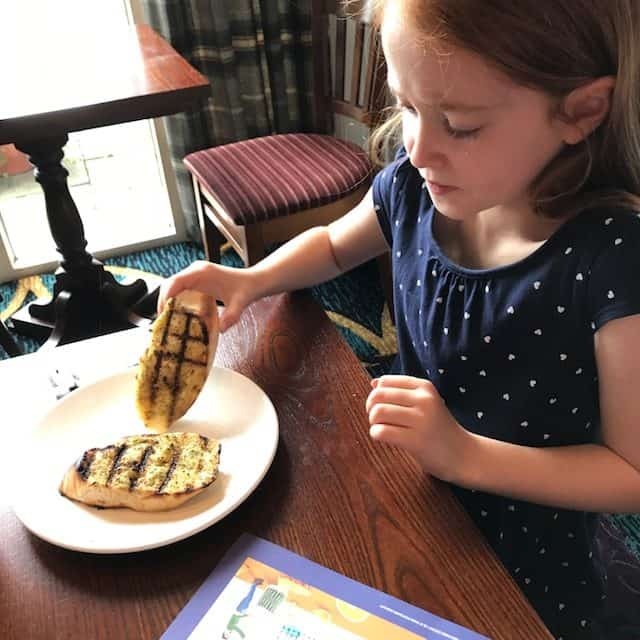 We were really surprised by the prices at The Giffard Park: we saw we could all eat for under £10 during the week (drinks would be extra though). 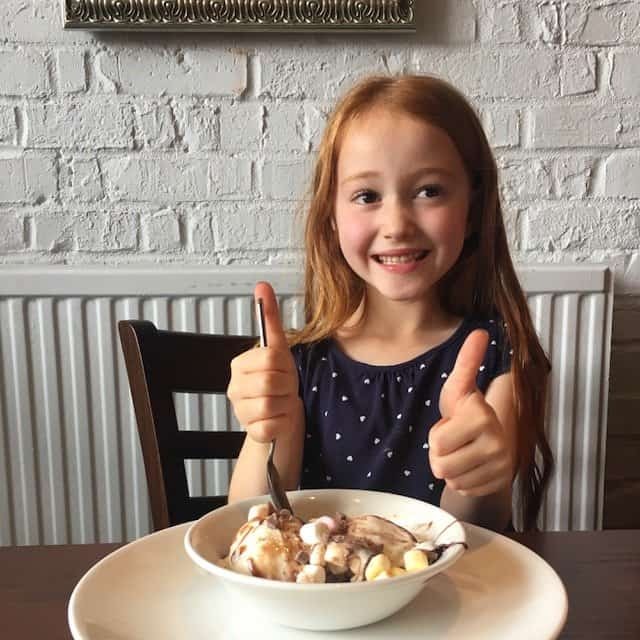 We decided to go for starters, mains and desserts, to see how much we could get for £50. Ryan and I started with nachos to share, Thea had vegetable sticks and hummus and Ava has garlic bread. 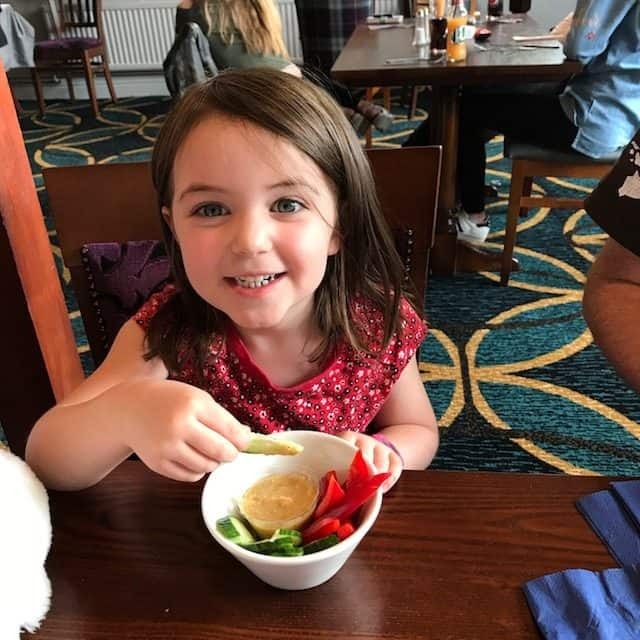 The nachos were good but Ava didn’t like her garlic bread so she swapped with Thea. But neither of them liked the hummus. I tried it, as they normally love it, and it tasted of curry, so that was a bit random – I’m not surprised they weren’t keen. Our main courses were more successful. 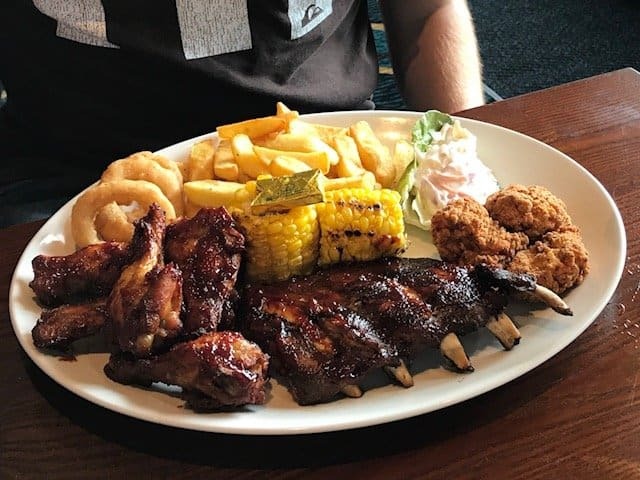 Ryan had an All American Platter (£9.49) which was so big he couldn’t finish it. 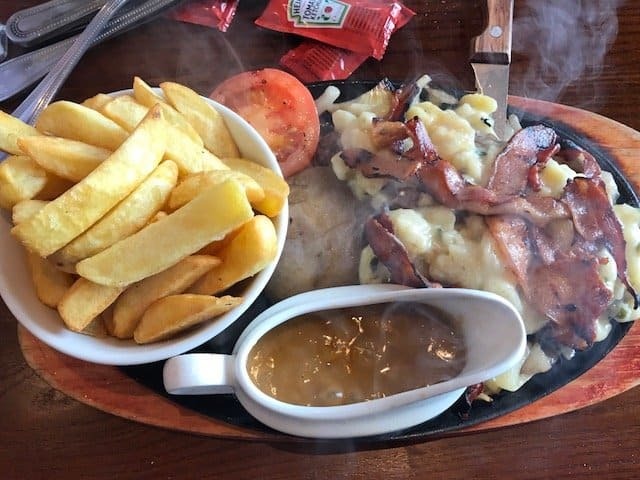 I chose a New Yorker loaded steak, which was a steak covered in macaroni cheese and bacon – again, too big for me to finish! It arrived on a sizzling platter which the girls thought was amazing. I asked for my steak medium and I think it was slightly overdone, but had a good flavour. 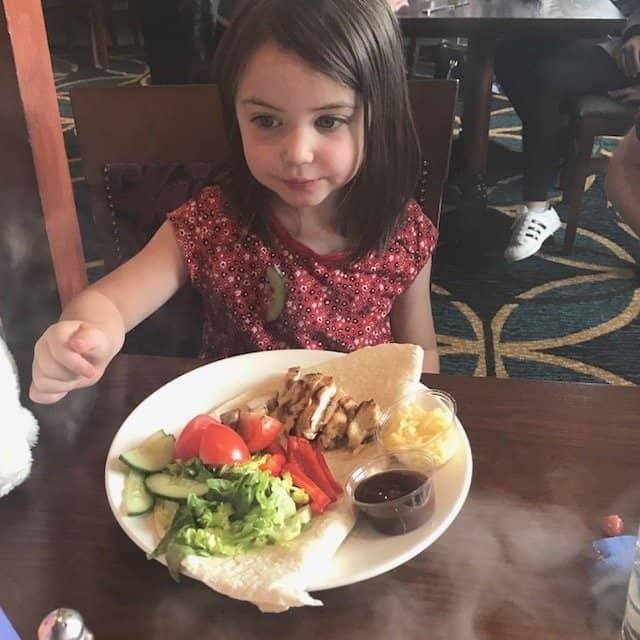 Thea had BBQ chicken wraps which she loved as she could make them herself, and Ava had fish goujons, which she said were “too fishy” – there is no pleasing some people! Sorry the photos are a bit smokey, it was from my sizzling steak! 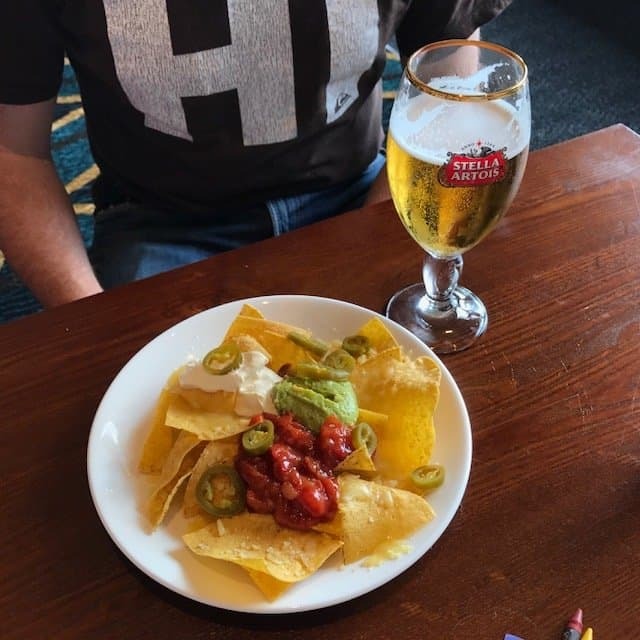 We enjoyed our mains, but I was a bit disappointed in the chips, they were a bit pale and flavourless. 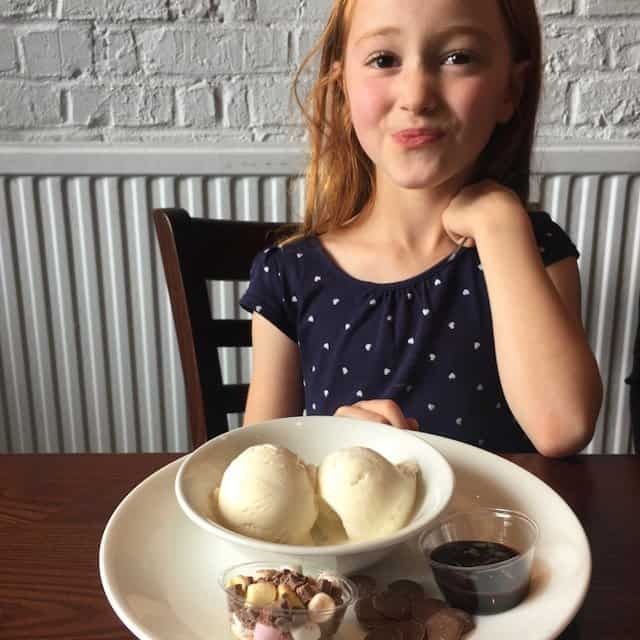 Our desserts were definitely the highlight – Thea chose a cookie, and Ava had a Build Your Own Sundae (£1.29) which she was over the moon with. 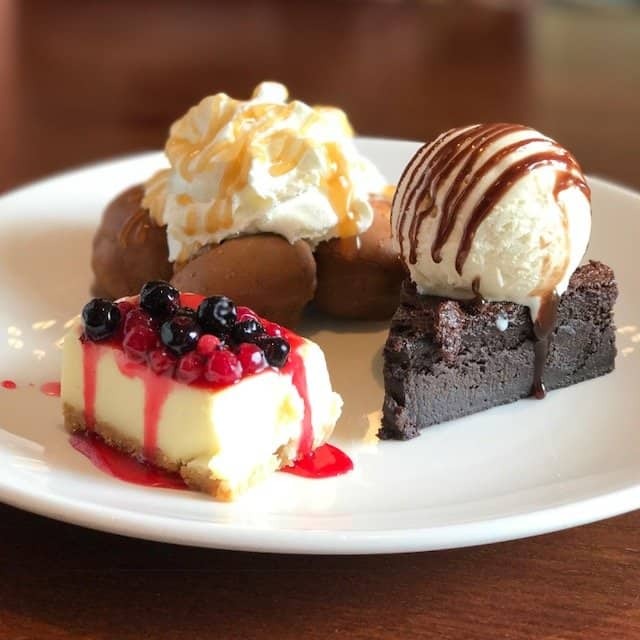 Ryan and I shared a Trio of Desserts as we couldn’t manage anything else. It was really yummy. 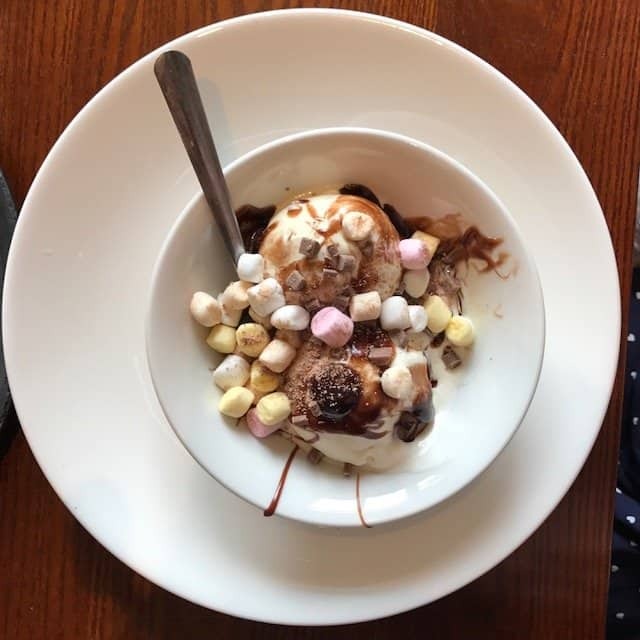 It included a warm chocolate brownie, ice cream, lemon possett crunch with berry compote, salted caramel profiteroles with toffee sauce. So good. We all had drinks, and Ryan and I also had coffee and tea and it came to under £50. I think this is great value, with very generous portions. The service was quick, so the girls didn’t have time to get bored. 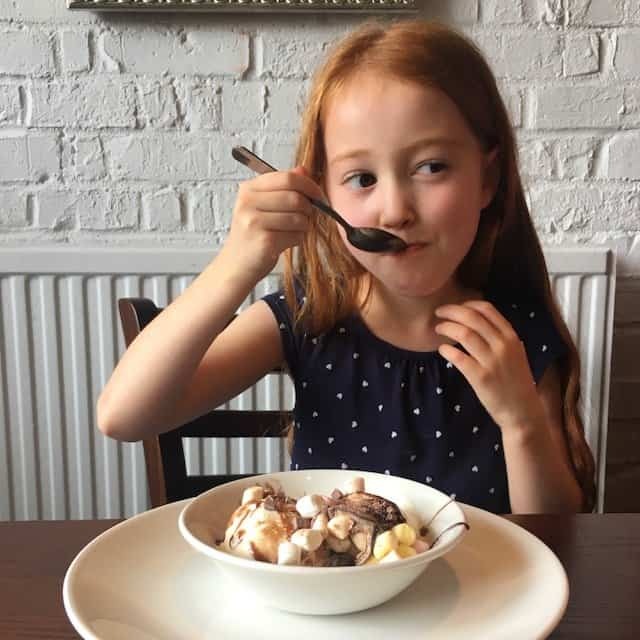 It’s not somewhere you’d go every week, as those desserts and big portions are too tempting, and not the best for the waistline! 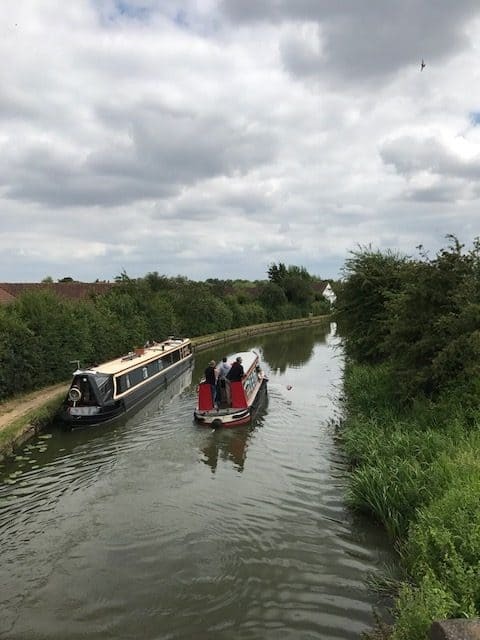 The Giffard Park is next to a canal, so after lunch we went for a little walk and did some boat spotting. 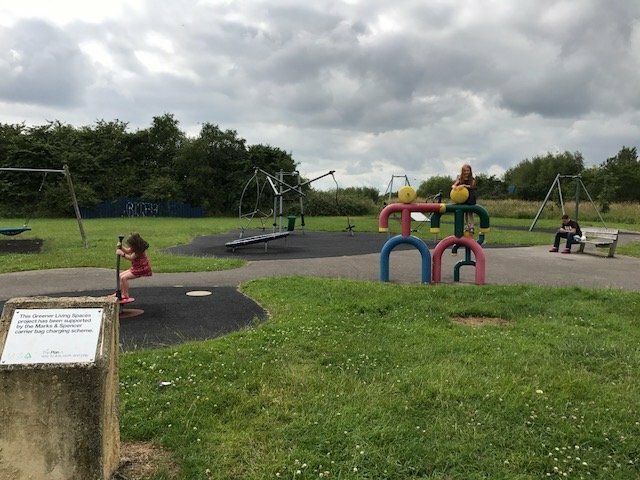 Over the bridge, there is a nice little play park, so the girls had a chance to run off some of the food they’d consumed! We had a really nice time together as a family.